Traffic control on the roads is getting more important every day. With increased traffic, more distractions on drivers and first responders getting struck while trying to assist the public, NFPA 1091 offers a new standard for anyone who performs traffic control duties at incident scenes. 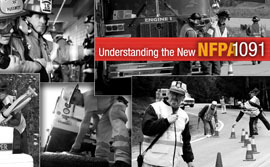 Learn about the new standard at ResponderSafety.com when this new module is released soon! For now, check out the Trailer and register for the Responder Safety Learning network. You will be notified when the module goes live!